New contributor klaxon: This week we give a warm We Are Chester welcome to new contributor, Paul Brand, one of the creative minds behind the cultural gem that is known as Screen on the Lane. Screen on the Lane, for those of you not familiar with this cool event, is a community cinema set in Chester’s hip and happening Garden Quarter. 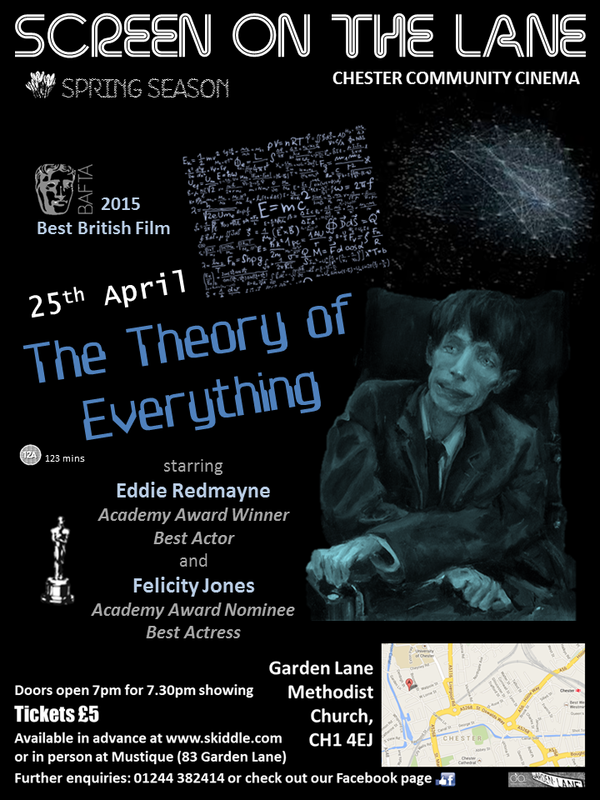 It’s the brainchild of a group of film enthusiasts and takes place once a month on a Saturday. We don’t know about you but this sounds like it has the makings of a pretty cool night out and a chance to meet fellow film fans. So, without further ado, we hand over to Paul. We live in a great city, so let’s get the negative out of the way quickly: whilst we await the regeneration of the Odeon, there is nowhere within walking distance of the walls to watch the latest box office hits. As a thirty-something London émigré who studied film at university, I find this a strange and troubling scenario. Our capital city spoilt me. Not only was there always a multiplex or a quirky independent cinema no further than a couple of tube stops away, in recent years Secret Cinema has changed the whole movie-viewing experience. Shortly before making the move north I got to enjoy heavy-metal mockumentary Anvil: The Story of Anvil at the Hammersmith Apollo, climaxing with the screen raising to reveal the ’80s cult heroes themselves on stage, ready to rip through the not-quite hits that we’d just heard the hard-luck stories behind. Other Secret Cinema experiences included custard-pie fights during Bugsy Malone at an art deco dance hall, and a Warriors-themed funfair on London Fields, Hackney. Well, not quite nothing. A major caveat needs to be added to my initial criticism: we don’t have a permanent, commercial picture house. What we do have is a plethora of film clubs, film societies and community cinema. Kudos also to Moonlight Flicks, which is due to return in July and August this year, and is run by Chester Performs, the closest we have to a Secret Cinema-style organisation that manages to take film out of our homes and into magical new arenas. It is all too easy these days to rely on Netflix, Amazon Prime and Sky Movies to project the latest releases onto our 36” smart TVs in the comfort of our living rooms. But any committed cineaste will tell you that something vital is lost if you strip away the crowd and the communal experience cinema offers. Home cinema, for all its benefits, comes with too many distractions. In the mobile age we need somebody next to us to ‘tut’ each time we’re tempted to check our phone. And a good film sparks conversation and debate. Film is best enjoyed in a group, not in isolation. Which is why I help to run the community cinema Screen on the Lane. The lane in question is Garden Lane. 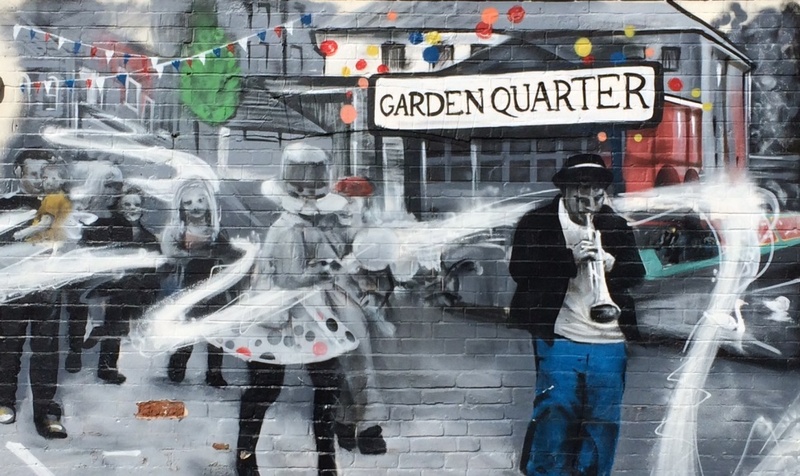 Garden Lane, for those not in the know, is in the Garden Quarter, which seems to be one of Chester’s best kept secrets. Just north of Northgate, follow the canal round to Telford’s Warehouse and there we are, occupying the space between Sealand and Parkgate. The bustling student population keeps us young but don’t, as one estate agent made the mistake of doing, refer to the area as Studentville within earshot of any resident over the age of 21! Screen on the Lane is long established within the Garden Quarter, providing a convenient night out for locals who lack either the ability or the inclination to make the trek to Cheshire Oaks, but when we re-launched last spring it was with an awareness that we’re now serving every Cestrian cinema-goer who’s currently being starved of celluloid. We can’t unfortunately offer a large range of new releases and granted, the Methodist Church where we host our screenings is not as enchanting as the Roman Gardens or as impressive as the Apollo, but we can provide a quaint communal charm which to many, myself included this time last year, is an entirely novel experience that has been long lost in city centre multiplexes. Having to squeeze extra seats along the altar to accommodate latecomers was presumably not a common sight at Odeon, Vue or Cineworld screenings of Philomena! We programme the occasional classic or topical film, such as tearjerker War Horse to commemorate the centenary of the Great War, but generally we aim to show quality films before they’re available on DVD or on-demand TV. 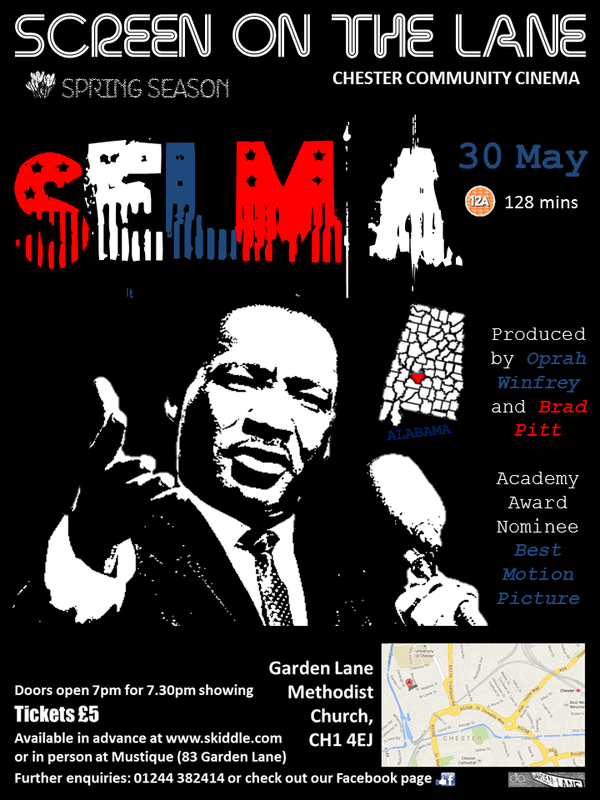 This month (April) it’s Academy Award-winning Eddie Redmayne as Stephen Hawking in The Theory of Everything, and next month is acclaimed Martin Luther King biopic Selma. It would be great to see you there. And even greater if you were to hang around for a chat after. Don’t worry – even though we strive to make cinema-going an interactive experience, you won’t be tested on the theory of relativity or the civil rights code. Thank you so much for all the likes and social media shares guys – much appreciated. Screen on the Lane is a real cultural gem in our beautiful city!